Despite what we know about networks and networking organisations still tend to be understood as simple, formal hierarchies, represented by an organisational chart or organogram. It is time to challenge this convenient fiction, which at best facilitates standard modes of production, handles easily anticipated problems, and illustrates linear reporting relationships. Crucially, it hides a far more subtle and informal network of relationships that comes into its own when the unexpected happens – which seems to be far more frequently these days! Effective informal networks facilitate the exchange of accurate information around who has what, who can do what and who needs what. They also facilitate the exchange of ideas that can feed innovation. By visualising and analysing informal social networks managers can bring out the strengths in their networks; realign their formal structure to complement the informal; and rewire faulty networks to work with company goals. The three key networks you should consider are communication, advice and trust. Communication networks provide information about news or events at work. Examination of communication networks can help diagnose inefficiency and low productivity, on the basis that workers are either spending too much time and energy working the rumour mill, instead of actually working. Or they hardly communicate at all, leading to errors, alienation, stress and poor morale. Advice networks are about solving task related problems and obtaining technical information to perform one’s duties. Understanding advice networks can uncover routine conflicts, recurring disagreements over how things should be done, or the assumptions one should be operating by. Advice networks diagnose such disagreements by showing when there are contradictory sources of expertise, unused sources, or no sources at all. Trust networks are associated with the sharing of confidential or ‘political’ information and the provision of support for one’s ideas and proposals. Analysing trust networks is particularly useful for diagnosing non-routine problems, such as failing change efforts. Non-routine situations necessarily involve uncertainty and the need to generate new ideas about what to do, how to do them and generating support for those ideas. The trust network can identify good candidates for bringing the organisation together to make change happen. 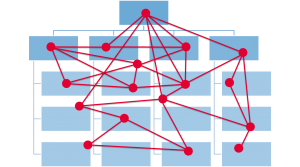 At PSA we develop 2D pictures of team and organisational networks using network visualisation software, by asking each team member to identify who they communicate with, seek advice from and trust on the basis of one simple question for each network. It is simple but very powerful. However, even without the software, it is still possible to do a preliminary analysis of your team’s informal networks by asking a few insightful questions. In terms of communication you need to identify who the connectors are in your team or organisation? The extraverts who like to talk and gossip, those team members who know a lot of people and like to share what they know. Or simply those in a position to know what’s going on, like Personal Assistants, those on the front desk, or just those who spend a lot of time in the tea room! If you wanted everyone in your team to know something, who would you tell? When considering advice you are generally looking for expert operators who have the skills, knowledge and experience that other people need. First identify what skills and knowledge your team needs to operate efficiently and effectively. Then, for each skill or aptitude identify the novices, the masters and the coaches (those who can teach what they know). You are then in a position to share all that knowledge and all those skills around the team, through group training or individual coaching. If you identify any critical skills or knowledge that reside in just one person you may want to consider an urgent download to someone else too. Trust is the vaguest concept of the three, but it is also the most powerful, being the bedrock of high performing teams. It is also emotive, so we sometimes use the term support instead and always emphasise that this is not about a person being trustworthy or not, but a simple recognition that at work we know and get along with some people better than others, and this affects how efficiently and effectively we work together. So, in the first place, identify the key relationships in your team, why are they close? Consider how you might build better relationships among the rest of the team, do they simply need to get to know each other better. But a word of warning – beware cliques, closely knit groups who exclude others. Whatever you discover, the time has come to make explicit what we know implicitly about how work gets done in teams and organisations. We need internal depth to our networking as well as external breadth.